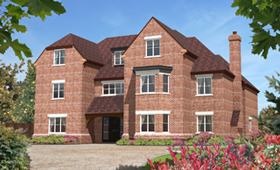 An exclusive development of five luxury two bedroom apartments and two period-designed cottages in a private garden setting. The attractive, historic Market Town of Winslow is located between Buckingham (6 miles) and Aylesbury (10 miles) surrounded by beautiful countryside and has a population of approximately nine and a half thousand. It is home to Winslow Hall, one of Buckinghamshire’s finest properties erected in 1700 by William Lowndes and designed by Christopher Wren. It has a wide range of amenities, including a variety of shops, tea rooms, coffee shops, restaurants, a bank, a hotel, post office, both private and NHS doctor’s surgeries and a dentist. Winslow also boasts a variety of social events including The Winslow Show and a Christmas Fayre. There are numerous sporting clubs including a tennis club, a bowling club, a cricket club and football clubs. Winslow is extremely well situated for access to the M1, M40, A41 and A43, making it ideal for commuters to London, Buckingham and Oxfordshire. You can enjoy convenient local amenities and quality education at Winslow Combined School, Buckingham School and Royal Latin Grammar School, as well as fee paying private schools, Furze Down special education school, and due for opening September 2013 a newly formed Free School. For more extensive shops, restaurants, bars and leisure facilities, including one of the UK’s largest shopping centres, the thriving city of Milton Keynes is nearby. The area offers excellent train links from Milton Keynes (9 miles), Bletchley (6 miles) which go to Euston, and Aylesbury (10 miles) link for Marylebone. The new East-West Rail Link (Oxford to Bedford) railway line will be opened in 2017 using the existing line with a new train station coming to Winslow offering many benefits to the local community.